We are dedicated suppliers of home health care equipment who import and supply equipment to businesses end users at wholesale prices. We are proud to be able to serve our customers and look forward to being able to fulfil your needs. A growing trend among competitive athletes and weekend warriors is the use of graduated compression socks to help improve their athletic performance and recovery. As the global leader in graduated compression therapy, Sigvaris creates superior sports products featuring true graduated compression for athletes and active people. Contains: 67% Fine Merino Wool, 26% Nylon, 7% Spandex - Latex Free! Hand washing is recommended, but you may machine wash on the gentle cycle with garment turned inside out. Use lukewarm water and a mild detergent. To protect the garment during washing, we recommend turning the garment inside out before washing. The two most Important choices you need to make, when choosing a compression stocking, are the size and the compression grade. Getting either wrong can cause you more harm than good. If you are using a doctors prescription, it will specify the compression grade, but you must still measure yourself to get the correct size. 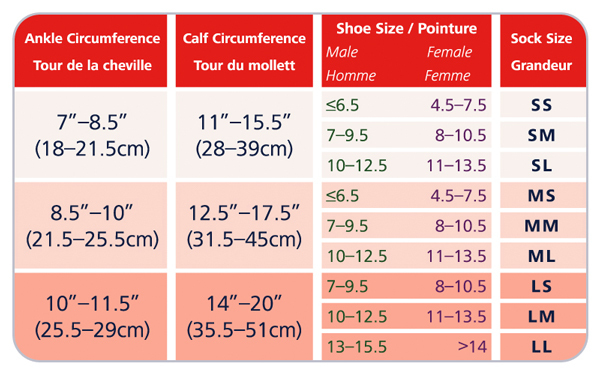 NOTE: This sizing chart is only good for Sigvaris products. 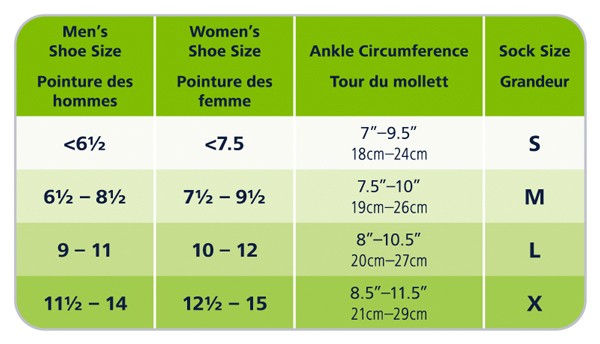 Jobst has it's own set of size charts for its own products. **The information found below is only general information and is not meant for the diagnosis or treatment of any medical conditions. Always consult your physician or other health care provider about all health concerns, conditions, and recommended treatments. Compression stockings, pantyhose and socks help control blood flow and fluid buildup in the legs and can be used either as a preventative measure or a treatment to deal with tired or aching legs, leg swelling (edema), varicose veins, spider veins, blood clotting (deep vein thrombosis) and other conditions. Many people who experience long periods of standing or sitting, are pregnant, suffer from poor blood circulation or fluid retention can benefit from the use of compression products to prevent or minimize the effects of these situations and conditions. Graduated compression stockings are designed to provide various levels of pressure on the legs beginning with the most pressure at the ankles and reducing in graduated steps along the length of the stockings with the least pressure at the top of the stocking. This graduated level of pressure along the leg enhances blood flow and minimizes swelling. Calf length – Used by people whose swelling, aching or vein problems are confined to the feet and ankle areas. Compression stockings are rated by the amount of pressure that they apply to the skin surface in millimetres of mercury (mmHg). Lower ratings provide enough pressure for comfort and some preventative properties. Higher ratings will also provide comfort but also provide more therapeutic levels of pressure needed to treat some more severe conditions. 15 - 20 mmHg rated stockings are considered light compression stockings and are often chosen by people who do a lot of travelling, stand all day at work, suffer mild leg swelling or are pregnant. They can be helpful in minimizing varicose veins, spider veins, edema, thrombosis or venous insufficiency. 20 - 30 mmHg rated compression stockings are considered light medical compression stockings and are used by people who suffer more severe instances of leg problems such as legs that often feel tired and heavy, have moderate swelling and varicose veins because of pregnancy or for preventing blood clots after surgery. Stockings with this rating should only be purchased on the advice of a physician or other health professional to avoid causing additional medical damage or injury. 30 - 40 mmHg rated compression stockings are considered medium medical compression stockings and are chosen if you have moderate to severe varicose veins during pregnancy or due to another condition, moderate edema, after a vein treatment like vein stripping, as a treatment for ulcers, and to combat diseases like lymphedema. Stockings with this rating should only be purchased on the advice of a physician or other health professional to avoid causing additional medical damage or injury. A variety of materials can be used to manufacture compression stockings including materials such as nylon, cotton, spandex, silicone and natural rubber. The composition of the stocking material will determine the characteristics of the stockings' elasticity, softness and appearance. To avoid potential allergic reactions it important that purchasers are aware of the materials used in the manufacture of their purchase. If you are not completely satisfied with your compression stockings, you may return or exchange them within 30 days of purchase. All returns and exchanges must be new, unworn and returned in their original product packaging. Products that have been damaged or worn can not be returned. In order to return your stockings and get credit or refund you must contact us to obtain a return authorization prior to returning.